Hanging onto the flippant disregard for the integrity of the nation state, with their lack-lustre defence in the referendum for Scottish independence, the civil servants in Westminster and their willing local politicians in Greater Manchester signed an agreement to champion the calls for freedom and democracy oop north. Only no-one in Manchester had been calling for devolution outside of a small coterie of local administrators and politicians who could see their names in the limelight. Indeed, just a few years ago, proposals for a locally elected Mayor rejected the idea - and that in the wake of Labour's plans to impose regional assemblies on us was well and truly thrown out by the electorate. So why does the devolution of power in Manchester seem to have come from nowhere in particular, and certainly with no-one on the streets marching for devolving administrative powers from civil servants and bureaucrats in the corridors of Westminster to their mini-me versions in the Town Halls of the North? And is there anything to get excited about in the return to the northern localism so bitingly characterised in the BBC's 'League of Gentlemen', ahead of the real-life parody pioneered by John Prescott? Whilst the Nineteenth Century saw a flourishing of a predominantly localised administration of public life, with the legacy of Town Halls we have now, the Twentieth Century saw a determined centralising of power in national institutions - accelerated though not driven by the two world wars. In the economic sphere, where capitalist economic competition of the free market was failing, the state was stepping in to prop up - literally with coal mining, attempt to reorganise and rationalise, and finally to try and return to the market place for some desperately needed cash. Whilst some individual capitalists and some more principled intellectuals may have objected to the state's expansion into wider social and economic areas, practically speaking there seemed little alternative to avoid the collapse of large areas of social life. The Labour Party often found itself as the spokesperson for the increase in state intervention, even promoting it as socialism in action. The legacy of widespread state intervention across political, economic and social life is one where economy simply cannot survive without extensive intervention, despite not being able to offer much by the way of hope for resolving the UK's historic decline since the Age of Empire. Anyone suggesting a reduced role for the state today, is often seen as a headbanger stuck in a romantic Nineteenth Century view of the world, or crazily doctrinaire as Margaret Thatcher is usually tagged - despite the government she led increasing the extent of state intervention rather than reducing it. It now looks like the Cold War and simmering class war it obscurred were about the only things that kept the establishment together - and how desperate they look floundering to invent an enemy to cohere society around as their previous enemies have been shown to be not what they seemed. With the Thatcher and Blair eras seen as failures and somewhat lacking in credible approaches to reversing the UK's fortunes, and an absense of ideas to cohere economic or social development, we're left with politicians and the civil service tinkering with their own desk layouts, rejigging the filing system if you like. 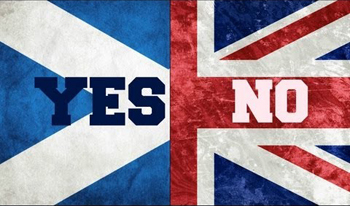 The Scottish National Party have made unwarranted headway in the vacuum of ideas, and caught the government offguard and forced them to offer all sorts of devolutionary powers to the Scottish parliament, despite not winning the referrendum vote for devolution. Unpeturbed by the clear rejection of the idea of regional assemblies in November 2004 by an overwheming majority in the North East (78%), the Labour Party who were so integral to the centralising state, had little else to offer especially as blaming us all to being too thick (New Labour's education, education, education mantra) couldn't keep them going forever. True New Labour stallwarts like George Howarth in Liverpool (the imposed candidate) blamed the electorate for not understanding the geographical areas like the North East and promoted city based assemblies for Liverpool and Manchester as more likely to win support. George Howarth at least recognised that this vote was legitimate, given that he became candidate in Knowsley when the Labour Party didn't recognise the vote by their local party for their candidate and imposed George on them. So what of voting for devolution in Manchester? Well, in May 2012, there was a majority of 6,000 who voted against having an elected Mayor in Manchester. Leader of Manchester City Council, Sir Richard Leese, said it was a "very clear rejection". 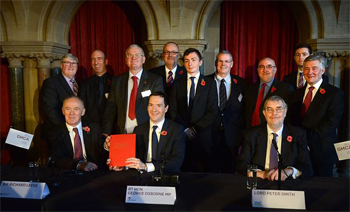 Just 2 1/2 years later, in November 2014, and having learned not to ask the electorate, Sir Richard Leese signed an agreement with George Osborne for devo-manc including the election of a Mayor for the City. Indeed, Sir Richard now reposes it as "a revolutionary shift in power from our remote parliaments to local people who know their places best". Orwell would indeed be proud of such terminology for a flagrant usurption of power from the ballot box to the corridors of the Town Hall. In the light of £6bn budget for the NHS in Manchester being handed over on top of the initial devolved powers, and giddy with what the rush for localism seems to be delivering, Labour Councillor Pat Karney, not one to be of the limelight, has announced he wants to bring 'super devolution' to north Manchester with the launch of Moston Town Hall. Is there anything positive about Whitehall busily trying to hand over reponsibility to others? Well, Andy Burnham responded to the devolution of NHS spending with concern over an increase in postcode lottery aspects of NHS service delivery, well aware of the split between Labour Policy and local council Labour actions introduced by George Osborne ahead of the election. There's certainly no popular demand for the League of Gentleman to become real life, and this localism is being driven more by a lack of coherence at the level of central administration, and indeed, belief in the superiority of centralised administration and decision making. The spirit of not trusting the electorate and working out how to bypass them is at the heart of this Devo Manc, and the state eating itself because of that doesn't seem to offer anything positive from what I can see.